Maybe you’re planning a brand new design, or trying to fix up your existing bathroom with a remodel or renovation. Whether you want to create your own bathroom design or work with a professional, you should be on the lookout for these common mistakes. You don’t want to spoil your design by cluttering up the countertop. And you don’t want to trek miles every day between your bathroom and storage in another room. 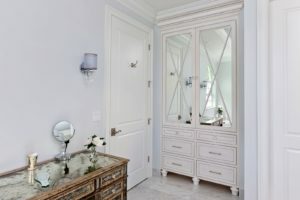 When you create your design, make sure it includes plenty of compact, convenient bathroom cabinets and storage space. It’s a lot of fun to renovate or remodel a bathroom. You’re probably looking up inspiration in magazines, online, and from friends. But don’t get carried away by the latest fashions! Make sure you choose a design that’s elegant and will stand the test of time. Remember: if you won’t love it in six months’ time, it’s out. Your bathroom design has to put up with a lot: heat, humidity, and daily use. So you need to choose materials which will last – and still look good. Choose strong materials such as stone or stainless steel; or if you want to use natural and organic materials, ask your supplier if they have been finished and sealed correctly. Most of us check the bathroom mirror as we get ready to face the day. Make sure your bathroom has flattering, generous lighting, so you can be confident that you’re looking your best! Proper ventilation will keep mirrors steam-free, and protect your bathroom from the effects of too much humidity. For more advice and expertise, talk to the DKB Cabinetry experts.